Chilly breeze beneath a fair sky. 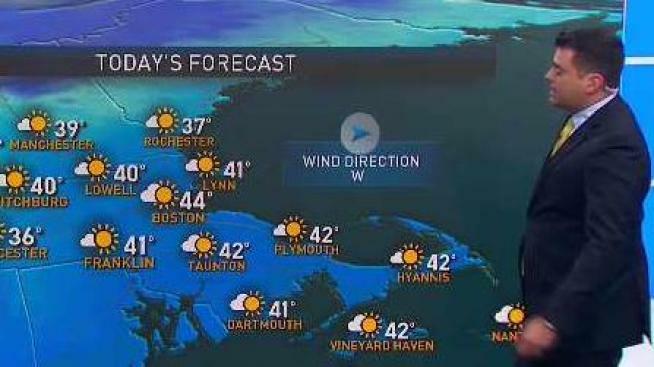 Highs around 40, feeling like the 30s. Overnight Monday: Mostly clear, breezy. Lows in the 30s. High pressure will prevail for today and Tuesday. Temperatures will be chilly and highs will only climb into the upper 30s and low 40s during the afternoon. It will remain breezy, so the wind chill will be in the teens and twenties for most of the day so dress in layers. Tuesday, warmer air moves in and temperatures will climb back into the mid 50s. It will be the nicest day of the week on Tuesday. The weather turns active again on Wednesday — unfortunately it is the busiest travel day of the year. We’re expecting mainly rain except in the higher elevations of Vermont, New Hampshire and Maine. It turns colder and drier for Thanksgiving Day and cooler after Thanksgiving. Expect mainly dry weather and temperatures several degrees below average.